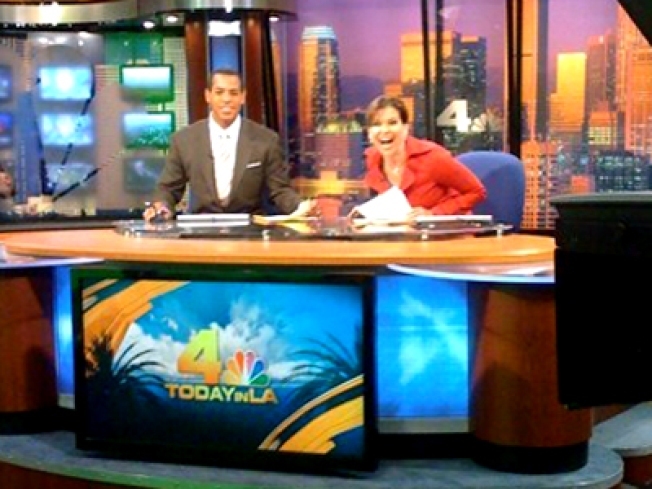 June 12: What's Jen Clicking on Between Newscasts? Why are fans more violent in victory than in defeat? Overheard (on Facebook) unnamed news anchor (okay it's me) writes: "is it wrong of me to root for Orlando because I dread covering the victory parade?" Answer from unnamed news photograper: "no it is not wrong, especially since you will be in the studio and my live truck will be on fire in the street." We in the news business have a certain sense of dread that comes with a winning home team. On the one hand, you want to see your home team win! It's exciting to watch, it's fun to cover, and you can be proud that the spotlight is on your city. But that's where there's trouble. At the moment when all eyes are on you, why do people have to ruin it by making our city look like a bunch of a-holes? Not to mention the fact that you run the risk of having your news van set on fire, but I'll get to that part in a minute. I already have been taking enough abuse from my Northern California hometown friends on Facebook for being an expatriate and rooting for the Lakers. The fans who proved their point were out last night on Whittier Boulevard, terrorizing people at red lights all to celebrate their team. You can see that video just below. So, what is wrong with them? What's the deal with rioting when your team wins? When the Bulls won the NBA championship in 1992 1,000 people were arrested and 200 people were injured in widespread violence and looting. What can I do to ensure that myself and my possesions (including my car) are protected? What if a crowd outside my window is tear gassed? I'm averse to gun ownership, but open to other ideas. 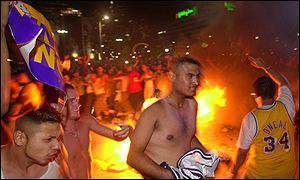 How did the idea of rioting when your team wins start? Noise, okay! Party, okay! But destructiveness? Apart from my notion that its a symptom of excessively boring lives, I don't get it. I'd leave town, given this advance warning. In LA, in '92, I just hunkered down. Living in Santa Monica at the time, we could smell the fires, the yuppies were going nuts -- they all went to the supermarket, filling it to overflowing with their queues of overflowing shopping carts. Myself, got my bugout pack all ready, just in case; but that proved to be a ridiculous preparation (and where would I have gone?) This is when shopkeepers traditionally break out the plywood -- if you plan to stick around, maybe you should, too. My biggest worry would be your car. I don't know if private home looting has ever happened after a sports victory, but cars parked on the street are easy random targets. Some suggested he park his car in a garage, or at an airport lot for the night, and there was a lot of advice on checking insurance papers to make sure you're covered for riot/civil disobedience damage, which apparently isn't standard on most policies. Back to damage. A few years ago during the celebration following a Lakers championship game (there have been so many, which one was it?) fans started burning stuff -- including a police car, and a news van (that was staffed by good friends of mine, by the way) in the most embarassing display of behavior I've seen that was supposedly a "celebration." Yeah, Staples doesn't do "home court advantage" anymore (show the away games at Staples) or show the game on the jumbotrons outside. And that's a shame. I made my way toward the largest bonfire, where rowdy fans were pushing others into the circle. I photographed a man running through the flames, and then saw a man hold an American flag above the fire. The crowd roared as the flag caught fire. It was then that I realized that this could get real ugly. At that point the LAPD were no where to be seen. Had they been a presence throughout the evening, perhaps things might no have gotten out of hand. I worked my way to the corner of 11th and Figueroa, where fans were throwing barricades and traffic cones indiscriminately. The crowd took over the intersection, roaring in the Lakers victory. A limo tried to make its way out of the intersection. The crowd responded by throwing the barricades at the limo, and then kicking and jumping atop of it. The driver screeched out of the intersection and stopped about 200 feet away, behind a line of LAPD officers. So, what the heck is wrong with people? Shouldn't they riot when their team loses? I don't get it. I found this little psychology piece online that explains "deindividuation," a fancy way of saying mob mentality I guess. Deindividuation involves a loss of self-awareness (Diener, 1979), which is essentially the degree to which one’s attention is focused on the self, resulting in comparisons of oneself against meaningful standards (Tesser, 1995). When spectators’ become deindividuated, their self-awareness plummets and they cease comparing their behavior against these standards. They tend to act like everyone else. Without the comparison process of self-awareness, people’s behavior is more likely to be inconsistent with their attitudes. For example, at a hockey game, the fans cheer loudest when they see a player get slammed into the wall or when they witness a fight. But how many of those same fans truly wish to condone violent behavior? The diffused responsibility and decreased self-awareness provide the wood and gasoline for deindividuation, but without the spark of social arousal, nothing happens (Diener, 1976). Sporting events are a particularly illustrative example of social arousal. Fans are watching, intensely involved in the game and already displaying a measure of arousal. They get even more aroused when something exciting happens, whether good or bad. I just don't want to see what happens next. Editor's Note: Everybody just calm down and eat cupcakes.